As you no doubt know, The Powers That Be eliminated tie games from regular play last November. Around that time, I developed a new system of calculating wagers. My calculator’s analysis of the March 9, 2015 situation. The calculator I built gives me all of the numbers I require – and then some. I doubt they’ll let anyone have it on stage, however, so let me walk you through the steps you need to properly calculate The Final Wager. Before we begin, let me point out that can use the concepts from my original, wager-to-tie tutorial to good effect. The goal of the new process is completeness, which means it gets a bit complicated in some scenarios, such as when all three scores are fairly close. But that’s fine; you can limit the number of calculations if you so desire. We’ll start, as we did with my original tutorial, with just two players. My revamped process borrows a concept from various branches of math: orders. We apply a process to the scores as they exist now; that’s the first order. Then we do that same process on those results; that’s the second order. And so on. First order: what happens when the trailer wagers everything? Second order: what happens when the trailer wagers the most he “safely” can in the first order? Some situations will have just one order; other games could have several dozen orders. For the most part, we’ll look just two orders deep; we’ll also take into account how each player should respond if the other player wagers zero. Each order consists of at most two steps. In the offensive step, we assume the trailer wagers the maximum available. What is the minimum amount the leader needs to cover? In the defensive step, we assume the leader is incorrect with that minimum wager. What does the trailer need to do to have a higher score? If the leader has the trailer locked out (e.g., the leader has more than twice the trailer’s score), we can ignore the defensive step. When we do the math, we’ll place two columns under each contestant’s name. After each step, you’ll place your calculated amount in either the “minimum” column or the “maximum” column for the appropriate player. To make the math easier (unless a Fritz Holznagel or a Tucker Pope is playing), we disregard the extra dollar until the end. That way, we won’t have to subtract $X,X01 from someone’s total. Another perk of this approach is that it will alert you to wager-to-tie situations: the same number will appear in both columns. If that happens, it’s up to you to determine what to do. I should also reiterate: if an incorrect response with a particular wager will eliminate you from contention, you should upgrade that wager to all-in. Don’t play for second. I’ll put together a video soon, but for now, the easiest way to explain this process is to show it in action. Our first example comes from the January 8 game between defending 4x champ Elliot Yates and eventual 5x champ John Schultz. We start with the first order. What happens if Elliot goes for broke? Elliot’s trailing, so let’s identify his highest possible score. John should wager to cover that. We place that amount in John’s “min” column, since he must wager at least that much (plus the dollar we’ll add later) to guarantee a victory if he’s right. Assuming John wagers to lock Elliot out, Elliot can win only if John misses. Let’s calculate what John will have left in that case, and determine what Elliot can (or must) wager to stay (or get) above that total. Unless John does something bizarre, Elliot will have to get it right to have a chance at winning. Therefore, he should wager everything. I put an asterisk next to that minimum wager to remind me to convert it to “all-in”. This might be helpful when things get more complicated. Assuming there’s not a third player involved, we’re all done. All that’s left is to adjust the wagers to avoid ties: add $1 to any “minimum” wager except for all-in wagers, and subtract $1 from any “maximum” wager. Easy enough. Let’s make things a tad more spicy, shall we? This situation comes from Vaughn Winchell’s third game, on December 30, 2014. Let’s start the way we did last time: with the trailer doubling her score. If Marcia gets it right, she’ll have 26,400. Vaughn will need to wager at least 8,200. If he’s wrong with that wager, he’ll have an even 10,000. Marcia can wager up to 3,200 to stay above this total. Notice how we placed that under Marcia’s “max” header. At the very end, we’ll remove a dollar from that wager. But Vaughn is a savvy player – and let’s say here that he knows that Marcia is going to cap her wager at 3,200. What should he do? In each new order, take the trailer’s maximum wager from the previous order. For Marcia, that’s 3,200. If she wagers to stay above Vaughn, she’ll have at most 16,400. That means that Vaughn can cap his wager at 1,800 and guarantee a victory if Marcia does as he suspects she will. Obviously, this puts him at risk of being passed if Marcia wagers enough. What is that amount? Well, if Vaughn is correct with that wager, the most he will have is 20,000 even. Marcia will need to wager at least 6,800. Note, however, that this is more than Marcia can afford – she’ll lose if she’s wrong. She should, therefore, wager everything if she chooses to go this route. We’re done, so we super-size Marcia’s big wager and do our $1 magic on the others. One more example – and we kick it up one more notch. This scenario comes from last Monday’s game, won (from behind) by Jen Jabaily Blackburn. If Jen doubles up, she’ll have 22,400. To cover that, Mike will need to wager 8,000. If he’s wrong trying to cover, Mike will be left with at most 6,400. Jen should therefore cap her wager at 4,800. So far, so good. Now on to some deeper thinking. If Jen plays conservatively and gets it right, she’ll have 16,000. If he suspects she’ll do this, Mike can cover her by wagering at least 1,600. If Mike does this and is wrong, he’ll have at most 12,800. To get in range, Jen will need to wager at least 1,600. We’ve narrowed things down to one range for Jen, and two for Mike. Let’s take one more possibility into account. Let’s say a player plans to wager zero. How should the other player respond? Mike will want to cap his wager at 3,200; Jen will want to wager at least 3,200. Any time you can tighten a wagering range, do so, which is why Jen’s new minimum 3,200 wager pairs with her maximum 4,800 wager. The minimum 1,600 wager gets bumped out. If it pairs with a smaller maximum, great; if not, we’ll throw it away. 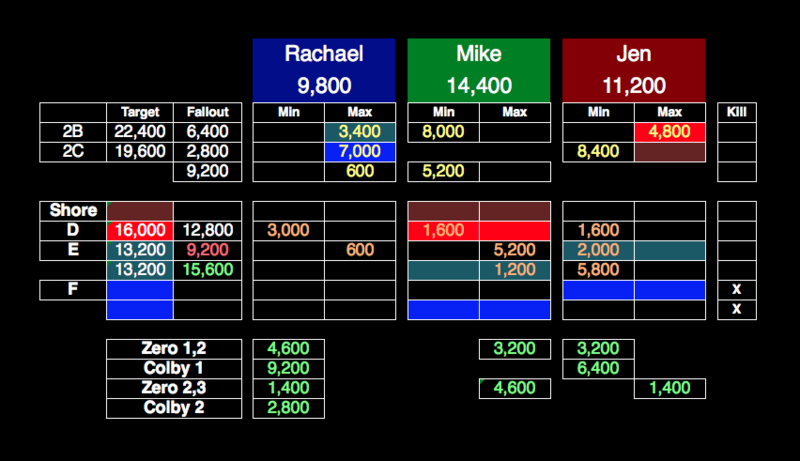 If Mike maxes out his wager at 3,200, Jen will need to wager at least 6,400 to cover him. Notice, however, that she’ll lose against a rational wager if she’s wrong – so she might as well wager everything in this case. I’m not really sold on this move in a two-player game; the probability that Mike will protect his lead is very high. It’s mathematically feasible, however. We eliminate any unpaired wagers and adjust what’s left. Throw in a third player – especially in a tight game – and things can get wild. Check back soon for Part Two of the new tutorial. In the meantime, if you want some practice, have a look at a few of this season’s analyses.